There's a view gaining popularity among Christians: "When God looks at me, He only sees Christ, not my sins or weaknesses." It's become such a popular phrase that some Christians think it's found in Scripture. But it's actually a misunderstanding of 2 Corinthians 5:21: "God made him who had no sin to be sin for us, so that in him we might become the righteousness of God." Believers enter God's Kingdom based on the righteousness of Christ. But God doesn't lose his omniscience when we're saved. He still sees us as we are, and we can be glad He does. Yes, God sees each believer as an individual, a unique person in His creation, sins and all. He loves us wondrously -- enough to help us change. (1) Christ both commends and rebukes the Believers in these two chapters. This passage doesn't say God no longer sees us for who we are. It says we are saved from who we are by Christ's righteousness. 2 Corinthians 5:21: For God made Christ, who never sinned, to be the offering for our sin, so that we could be made right with God through Christ. Romans 8:1-2: Therefore, there is now no condemnation for those who are in Christ Jesus, 2 because through Christ Jesus the law of the Spirit who gives life has set you free from the law of sin and death. Romans 8:11-13: And if the Spirit of him who raised Jesus from the dead is living in you, he who raised Christ from the dead will also give life to your mortal bodies because of his Spirit who lives in you. 12 Therefore, brothers and sisters, we have an obligation —but it is not to the flesh, to live according to it. 13 For if you live according to the flesh, you will die; but if by the Spirit you put to death the misdeeds of the body, you will live. John 14:21: Whoever has my commands and keeps them is the one who loves me. The one who loves me will be loved by my Father, and I too will love them and show myself to them." Revelation 3:19: Those whom I love I rebuke and discipline. So be earnest and repent. This devotion doesn't say you aren't forgiven or you aren't a new creation. 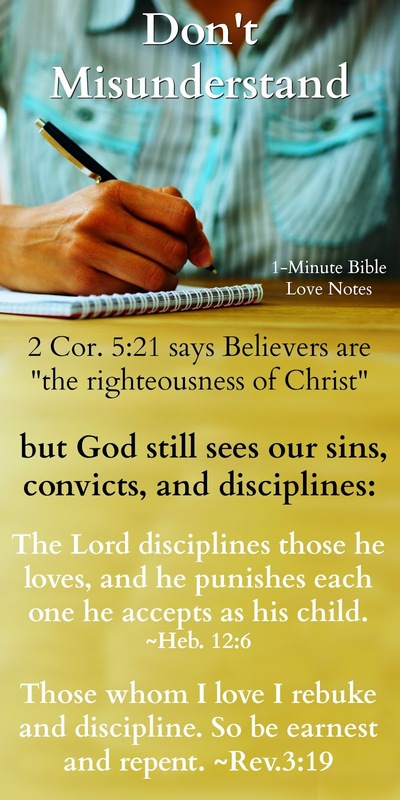 It says that God sees your sins whether you are saved or not. And you can disagree, but you are disagreeing with Jesus, not me, because Jesus said, "Those whom I love I rebuke and discipline. So be earnest and repent." If He loves you, He sees your sins. I agree that Christian's sins are forgiven and we are saved for eternity because of Christ's perfect sacrifice for our sins. But I believe what Scripture says about God seeing our sins, convicting us of our sins, rebuking and disciplining us for our sins. A popular saying, no matter how popular, cannot change these truths in Scripture. I think perhaps a key concept that needs to be mentioned is that when we get to heaven, our sin is totally wiped away and God sees it no more, remembers it no more, and sees only the righteousness of Jesus. What a beautiful thing to look forward to!! Beautifully and well said Gail. Stay blessed. In Isaiah 43:25 God declares, "I, I am he who blots out your transgressions for my own sake, and I will not remember your sins." In talking about Jesus as a perfect, once-for-all sacrifice for our sins, the writer of Hebrews says, "For by a single offering he has perfected for all time those who are being sanctified. And the Holy Spirit also bears witness to us; for after saying, 'This is the covenant that I will make with them after those days, declares the Lord: I will put my laws on their hearts, and write them on their minds,' then he adds, 'I will remember their sins and their lawless deeds no more.' Where there is forgiveness of these, there is no longer any offering for sin" (Hebrews 10:14–18). What does it mean that He "will not remember" our sins? Does God forget our sin? We know that God is omniscient, meaning He knows all things. Thus God cannot forget in the sense that a human does. It is not that our sins slip God's mind somehow. Rather, He chooses not to remember our sins. When we receive God's forgiveness, He does not hold our sin against us or treat us according to what our sins deserve. Psalm 103:12 says, "As far as the east is from the west, so far does he remove our transgressions from us." There is immeasurable distance from east to west. In going around a globe, there is really no point where a person starts going east and stops going west, or vice versa. God completely removes our sins. He does this through the Person and work of Jesus Christ. When Jesus died on the cross, He made payment for our sin. When we come to Him in faith, we receive complete forgiveness. God does not treat us as sinners deserving of death (Romans 3:23; 6:23), but treats us with love and grace (Ephesians 2:8–9). Second Corinthians 5:19–21 says, "In Christ God was reconciling the world to himself, not counting their trespasses against them, and entrusting to us the message of reconciliation. … For our sake he made him to be sin who knew no sin, so that in him we might become the righteousness of God." God not only makes payment for our sin, but puts our sin completely out of view and replaces it with His own righteousness. That being said, it is true that Christians will still struggle with sin (1 John 1:8). And we still need to ask for forgiveness of our sin to restore open fellowship with God. But, "If we confess our sins, he is faithful and just to forgive us our sins and to cleanse us from all unrighteousness" (1 John 1:9). Romans 7—8 is a beautiful depiction of how a Christian can struggle against sin and still trust in the faithfulness of a God who forgives and chooses to forget. Romans 8:1 says, "There is therefore now no condemnation for those who are in Christ Jesus" (Romans 8:1). God will not rub our sins in our noses or remind us of our sins to shame us. He lavishes us with His love and His grace. When we fall, we come to Him in humble confession, accept His forgiveness, and then move forward. We can remember that we were once sinners, enslaved to the flesh, but we need not endure accusations or feelings of fasle guilt over these sins. God forgives completely, and we can rest in that. With Paul we can "forget what lies behind and strain forward to what lies ahead, [we] press on toward the goal for the prize of the upward call of God in Christ Jesus" (Philippians 3:13).